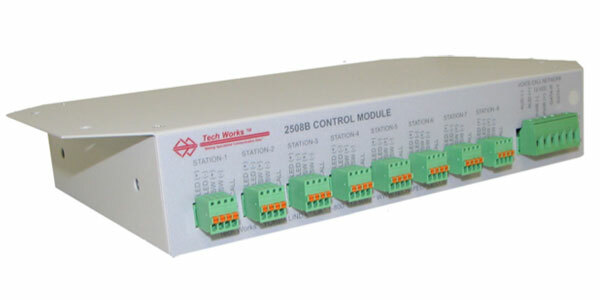 The Tech Works 2508 is a Data Collection/Control Module for use with our Voice-Call product line. Each input/output features both a call button input for connection of any normally open or normally closed contact and a call confirmation light output associated with it. All of our Voice-Call products employ solid- state control. Our digital control network allows control from any of our Masters or a Personal Computer Interface. Up to 64 of either the 2508 or 2528 units can be connected to a single network for a total of 512 speaker or control stations per system. Calls are reported as both unique programmable text and a call tone for easy identification of any call and where the call is coming from. The 2508B is intended as an easy way to monitor call points such as passive patient or pull stations. By programming the call points to monitor normally closed connections, alarm points such as windows, doors, or motion detector contacts can be monitored and reported to any Master or PC. Each call point has an associated Call Confirmation Light output which can illuminate at the calling station or a corridor light or both. The Data Collection/Control Module is housed in a metal enclosure with a removable wall mount top for installer access to adjustments. A set of 8 separate 4-conductor compression lock connectors provides easy connection of field wiring. These units can be located near the call stations, in an electrical room, or terminal closet with just three twisted pair wiring run to the next substation unit or Master. This eliminates the need for home run wiring all the way home to a Master or Central Matrix Switcher. Dimensions: 6.2″ W, 10″ H, 2″ D.
The 2508 uses 12 or 24 Volts DC from the network or a local power source. All communication is EIA standard RS485 data and when distance is an issue, fiber optic cable, microwave, and even satellite links can be used between units with the appropriate interfaces and local power source.